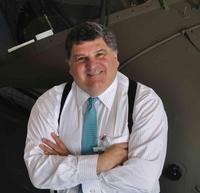 Nicholas D. Lappos is a Sikorsky Aircraft Senior Technical Fellow Emeritus in Advanced Technology, responsible for the Technical Fellow community and introduction of advanced technologies into new and existing products. Lappos spent a total of 39 years at Sikorsky Aircraft, first as a flight test engineer then at the pilot office where he spent 27 years. He has flown over 70 different helicopters and amassed more than 7,500 flight hours. During his time at Sikorsky, he participated in the development of the S-76, UH-60 Black Hawk, RAH-66 Comanche, S-69 Advancing Blade Concept (ABC), S-76 Fantail, S-76 Shadow fly-by-wire demonstrator, CH-53E Super Stallion, and the S-92. Lappos became the Director of Test Engineering and then the Program Director for the S-92 program, finishing its development and taking it through its successful certification. Under his guidance, the team won the 2002 Robert J. Collier Trophy. Lappos also spent three years at Gulfstream as the Vice President of Government Programs and two years at Bell as Chief Technology Officer and Vice President of XworkX, before returning to Sikorsky in 2011. In 2018, Lappos was selected for the prestigious 2019 Alexander A. Nikolsky Honorary Lectureship, awarded by the Vertical Flight Society to “an individual who has a highly distinguished career in vertical flight aircraft research and development and is skilled at communicating technical knowledge and experience.” His talk, "Design Advantages of an Integrated Cyber-Physical Aircraft", will summarize his experience as a test pilot and test engineer on how modern digital flight controls, real-time usage monitoring and airborne analytics can be harnessed to replace the stove-piped sub-system design rules that currently exist.